All our partner sites are independently reviewed by our team of industry experts. We examine 10 different criteria and award a score out of 10 for each, adding up to a final mark out of 100. You can read a full description of our Lucky VIP Casino review process here. Lucky VIP Casino received a score of 84/100. 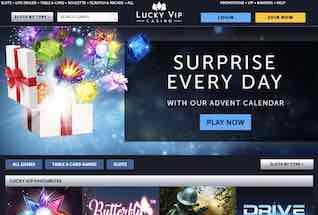 Lucky VIP is the latest casino to come out of the London-based Stride gaming stable. 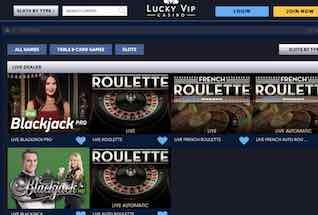 Unlike its sister sites, Magical Vegas and Spin and Win, Lucky VIP has been designed and built with table and card games in mind as much as slot games. So, as well as the classic slots from the likes of NetEnt, Lucky VIP has something for the table game and live dealer fans too. Stride have made a name for themselves as a top operator in the casino and bingo worlds and are now listed on the London AIM market. Their operation is licensed out of Alderney and the UK, which ensures security, fairness and safety with all gameplay and transactions. The design of the site has a classy feel in keeping with the VIP brand name, with dark colors and a logo that uses playing card symbols. 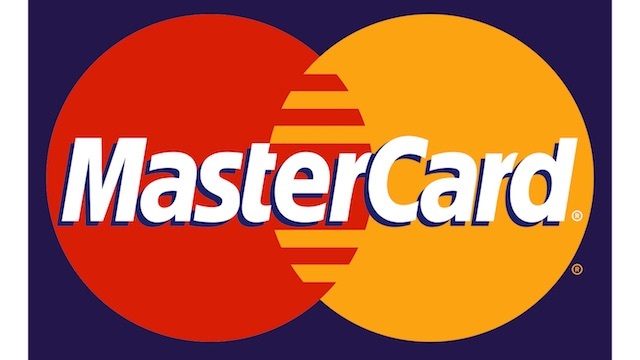 A wide selection of payment options is available to players, including Paypal and Paysafecard alongside the Visa and Mastercard options. For new customers, a three-deposit welcome package has been put together, including a 100% match on the first deposit. And as you would expect, Lucky VIP advertise a generous High Roller club for their top players, as well as a great selection of deposit and cash offers for regular customers. This is a new site for 2017 from a tried and tested operator. You can sign up now and claim your 100% match bonus or read on for our full site review. New customers to Lucky VIP get a three deposit welcome offer. The first bonus is a 100% match up to £100. The second and third deposits are each eligible for a 50% match bonus of up to £100. For the first deposit bonus the minimum deposit to qualify is £10 and the maximum bonus is £100. The bonus is not redeemable itself, and there is a 25x wagering requirement on the value of the bonus and the deposit before the winnings are converted into real, withdrawable cash. A maximum of £500 can be converted. For the second and third deposits players must deposit a minimum of £10 to qualify for the 50% bonuses. The maximum bonus is £100 and once again a 25x wagering requirement is applied and the maximum redeemable winnings is £500. For all bonuses at Lucky VIP Neteller deposits do not apply and there is a seven day expiry on the bonus – you must use it within a week. What Games Can I Play at Lucky VIP Casino? Lucky VIP has a broad range of games available to players, from slots and scratchcards through to live dealer and top class table games. This sets it apart from the previous casinos in the Stride group. 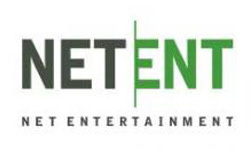 The best slot games include those from NetEnt like Starburst, Gonzo’s Quest and Emoji Planet. Another big slot provider, Microgaming, showcases their games here too: Immortal Romance, 108 Heroes, Thunderstruck and Tarzan. For table game fans, there are seven different RNG versions of Blackjack, including Blackjack Classic, Blackjack Exposure, European Blackjack, and Professional Series. There is also Deuces Wild and Casino Hold Em. There are also three European Roulettes and French Roulette and Monopoly Roulette. Lucky VIP have also put together a good selection of Live Dealer games from which you can enjoy the real casino experience with proper dealers and shared tables. From the Live Dealer button on the site you can play Blackjack Pro, two versions of French Roulette, and Blackjack HD. The generous welcome offer at Lucky VIP is a taste of things to come for customers at this new Stride Casino. For regular customers a wealth of offers including deposit bonuses, free spins and cash drops is available. But the real treats come to High Rollers in the form of a VIP club. Here you get loyalty points for every £1 wagered and deposited that can be exchanged for free spins, competition entries and plain old cash! Other perks for VIPs include reduced wagering requirements, quicker withdrawals, and treats like laptops and holidays. The top VIP levels are by invitation only. For deposits and withdrawals at Lucky VIP there are a variety of payment options. Players can deposit through debit and credit card with no fees and instant credit. Withdrawals take 2 to 5 days to process. 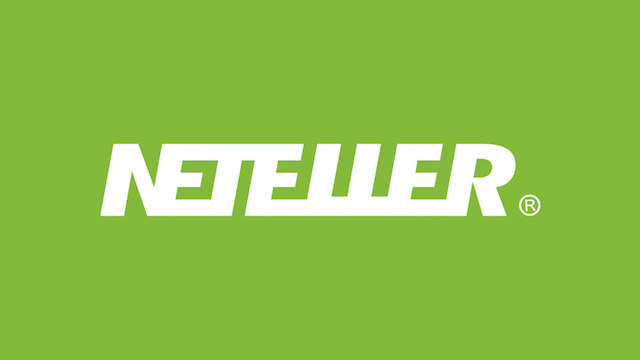 There are also some good eWallet options in the form of Paypal and Neteller. These can be quicker for withdrawals and are great for managing your money. Paysafecard is another option. The Lucky VIP site is simple and easy to find your way around. To jump into a game category just use the navigation across the top of the page. Its easy to find the game of your choice using the menu feature with filters for game types and themes. You can also search using the function that allows you to type the name of the game directly. All the important touchpoints of account, support and promotional information are just once click from the home page. Like all modern casinos, Lucky VIP is available on mobile and all the games, built in HTML 5 render brilliantly on all devices. This means you can enjoy the VIP experience on the go as well as on your desktop. Lucky VIP Casino offer the full range of support options – you can speak to agents via the phone line (inbound and outbound), by email or by Live Chat. In their Help Center there is also a lengthy FAQ to help you find answers to any questions you may have. The Stride Gaming operation is based in London. They have licensing from the UK Gambling Commission and the Alderney Gambling Control Commission. Under the terms of these licenses Lucky VIP must provide fair, safe and secure gaming to its customers.